Both parties talked about leadership, the economy, jobs, and families. More interesting are the differences. 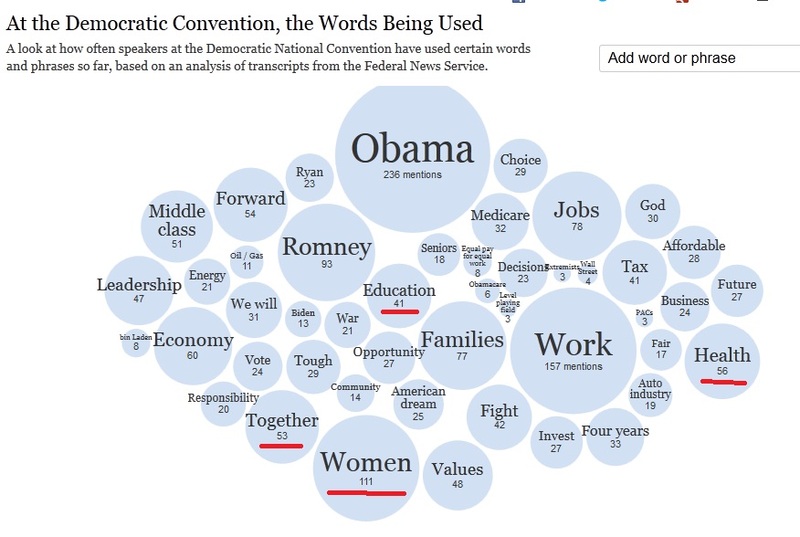 Democrats talked a lot about Women, a word which seems to be absent from the Republican vocabulary. The Democrats also talked about Health and Education. I find it curious that Education does not appear in the Republican word cloud. The Republican dictionary falls open to the page with Business – ten times as many mentions as in the Democrats’ concordance. 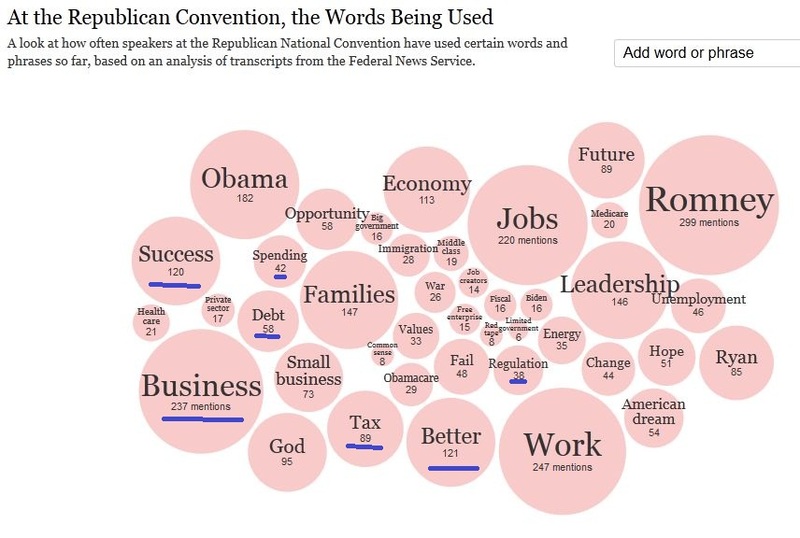 If you go to the interactive Times graphic, you can click on Business and see examples of the contexts for the word. Many of these excerpts also contain the word Success. You can put the large-bubble words in each graphic in a sentence that condenses the party’s message about government, though that word – Government – does not appear in either graphic. For the Republicans, government should lower Taxes so that Business can Succeed, creating Jobs. For the Democrats, government should protect the rights of Women and ensure that everyone has access to Health and Education. I find it interesting how much the dems say "middle class". The republicans mentioned both poor and middle class rarely but about about equally (12, 19) but the dems mentioned poor way less than middle class (15 vs 179!). Bill Clinton seems to be the highest user of poor, BTW. Kudos to him.